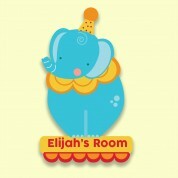 Our gorgeous circus door plaque makes a stunning addition to any nursery or bedroom. 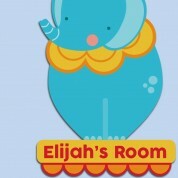 Blue elephant is proudly sitting on his podium. He is wearing a colourful circus hat and collar, and is about to perform his famous balancing act! The child's name is on the podium. The colourful, eye catching design will appeal to any child. As they grow they will love to learn the letters of their name whenever they look at it. All of our customised door plaques are individually personalised and printed in the UK. 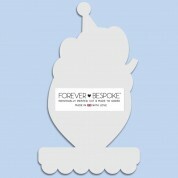 Our team of designers spend time on each one, making it a truly unique keepsake for each child. The recipient is sure to own nothing quite like it. We think the unique door sign makes a wonderful gift for any baby's special occasions - Christening, Dedication, Confirmation or First birthday, for example.